This month the staff from more than 200 small businesses are being trained on the new ‘Smart Business’ mobile app, which helps streamline operations and accelerate the sale of toilets across rural Cambodia. 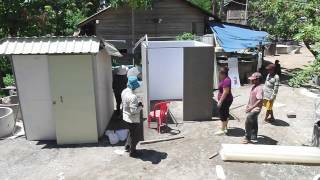 Learn more how mobile technology can help improve sanitation in Cambodia. Nop Min’s front yard is littered with construction material – pillars, toilet rings, and stacks of bricks take up nearly every corner of the yard. Two of Min’s employees load a truck with toilet rings, pans, and pipes to be delivered to a customer one kilometer away in Takeo province, Cambodia. With the help of his wife and five employees, Min produces and delivers 60 of these toilets per month and his family-run business has been steadily growing since it began in 2011. This is a common scene across rural Cambodia, where small and medium enterprises (SMEs) generate a large share of economic growth. By 2011 the number of SMEs had grown to an estimated half a million and provided two-thirds of all employment. The success of SMEs has been directly tied to the improvement in sanitation in Cambodia. Since 2010, WaterSHED has helped build the rural supply chain for toilets by partnering with more than 200 local businesses that have since sold more than 140,000 toilets across the country. Improvements in the rural toilet market have dramatically accelerated the rate of new toilets being built – now 7% per year in target districts compared to the national historical growth rate of 1% per year. Many of these SMEs faced difficulty managing their sales and obtaining capital to expand their operations. A lack of recordkeeping was a critical barrier – in fact, not a single SME working with WaterSHED had even a basic, paper-based business record system prior to partnering with us. Despite huge strides in implementing order and inventory management ledgers, most SMEs still communicate with sales agents by phone or in person. Paper-based ledgers enable much more professional and reliable business operations, but are tedious and prone to error. With a manual system, entrepreneurs have a hard time seeing a snapshot of their business performance, comparing margins across products, or identifying trends in sales, which limits their ability to analyze and optimize their growth. If a small business cannot accurately report key performance metrics, it also has more difficulty accessing affordable financing. Recognizing the opportunity to further improve the operational efficiencies of these SMEs, WaterSHED set the objective to develop a solution that was straightforward and easily adopted by small businesses. The result is “Smart Business”, a custom Khmer-language mobile app that tracks sales and inventory, and provides basic financial recordkeeping. With this easy-to-use technology, small businesses can better communicate with their sales agents, respond to new orders instantly, and anticipate stock requirements to ensure product availability. This means customers will get their new toilets faster than ever before. In May, more than a dozen small business owners took part in a workshop to learn and test the mobile app. Min was one of them. He now uses Smart Business on a daily basis to manage his sales and inventory. “It’s easy to track how much I sell every day, how many deliveries I need to make, and how much stock I have left.” According to Min, it’s much easier to run his business using the app, and he plans to completely transition his bookkeeping away from paper in the coming weeks. This month we are expanding the mobile app training to more than 200 small business partners who serve roughly 40% of the Cambodian population. With an automated sales and bookkeeping system, sanitation SMEs will have greater opportunity to streamline their operations, increase their revenues, and expand their working capital with more affordable financing. Beyond its initial functionality, ‘Smart Business’ has significant potential to offer additional capabilities. Intentionally built on an open architecture, it will serve as a platform for new features extending into other areas of small business management. The development pathway could integrate with consumer loan application processing; enhanced accounting, productivity, HR management and purchasing tools; as well as integrate with mobile money for payments between suppliers and sales partners. And like the toilets we’re pushing, there’s a lot more to build.